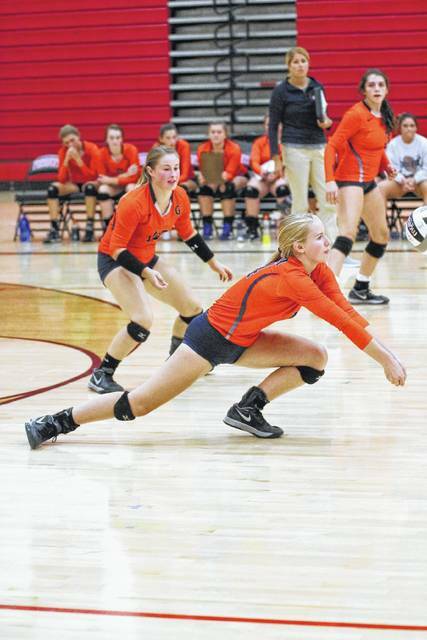 MARION — On Thursday evening, the Galion Lady Tigers volleyball headed to Marion to clash with the Harding Prexies in a Mid-Ohio Athletic Conference match. At the end of the night, Galion headed to the buses still undefeated in the MOAC after defeating the Prexies in three sets; 25-12, 25-20 and 25-18. The Lady Tigers are now 4-1 on the year and 3-0 within the conference. Serving was once again the key to the Galion victory as the Lady Tigers finished the evening with 46 total points off of the serve, including 16 aces. Leading the way was Kayla Hardy. Hardy finished the contest at 13/15 from the service line with five aces and 10 total points. Marisa Gwinner went 9/10 to earn four aces and five points. Kate Schieber had a stout serving performance as well going 16/17 with 12 points. Other serving stats for Galion against the Prexies: Jaden Ivy- 9/11, 7 points and 3 aces; Claire Miller- 2/3, 2 points and an ace; Abby Foust- 6/7, 2 points and Nicole Thomas- 10/10, 8 points and 3 aces. Galion finished their match against Harding with 25 kills as a team. The bulk of those attacks came from Gwinner and Samantha Comer. Gwinner recorded a dozen kills against the Prexies while Comer chipped in seven. Gracie Groves notched three kills and Gillian Miller, C. Miller and Ivy each contributed one. Hardy went 66/70 handling the ball and racked up all of the 25 Galion assists. Defensively, Gwinner and Ivy both picked up a block and Gwinner lead the way with 13 digs. The Lady Tigers had 52 digs in total in the road victory. Digs recorded by the Lady Tigers on Thursday were: Comer- 4; Ivy- 9; G. Miller- 4; Hardy- 6; C. Miller- 2; Schieber- 5; Groves- 2; Foust- 2; Thomas-4 and Josie Ehrman- 1. Two more MOAC opponents await the Galion squad next week. On Tuesday, September 5, the Clear Fork Lady Colts will head to Galion and on Thursday, the Lady Tigers will make the haul to Richwood to do battle with the North Union Lady Wildcats. Erin Miller | Galion Inquirer Stopping the attack! Galion’s Abby Foust digs out a Prexies kill attempt during MOAC action Thursday at Marion Harding High School. The Lady Tigers defeated the Prexies in straight sets to remain unbeaten in conference play. https://www.galioninquirer.com/wp-content/uploads/sites/38/2017/09/web1_abby.jpgErin Miller | Galion Inquirer Stopping the attack! Galion’s Abby Foust digs out a Prexies kill attempt during MOAC action Thursday at Marion Harding High School. The Lady Tigers defeated the Prexies in straight sets to remain unbeaten in conference play.